TELADATA is looking for Sponsors for our upcoming 2009 Technology Convergence Conference. The event’s great location and enhanced focus on attracting IT and Facilities decision makers has created a marketing opportunity you cannot afford to miss! 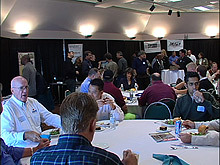 Please join us on February 19, 2009 at the Santa Clara Convention Center and reach decision makers eager to learn about the latest technologies, trends, and solutions for their top facilities challenges. "This was by far the best industry related conference that I have attended in my more than twenty years in the mission critical field." Over 400 IT, Facilities, Data Center professionals, and CIO’s from the high tech, legal, financial, health care, government, life science, educational, and entertainment industries will attend the event. Company recognition on the Technology Convergence web site. The web site averages over 2,000 visitors per event. There will also be a link from the event web site to your company web site.